Polar bear eyes are set in such a way that the animal can look forward with a binocular vision. However the bear’s eyes also enable her to have a pretty good vision of the sideways. Polar bear’s eyes are one of the least understood physical features. Scientists are carrying out research on the anatomy of eyes but so far with little success. 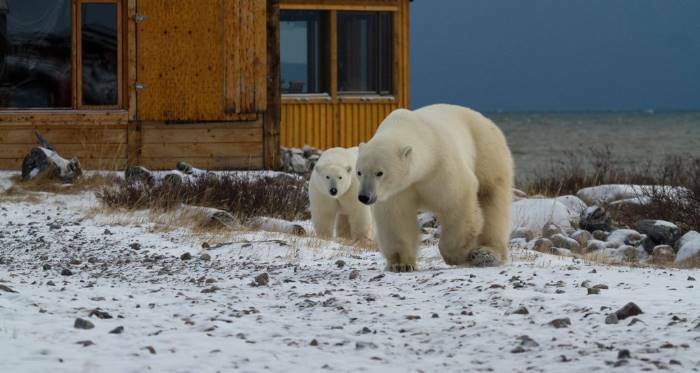 Much of the information is speculated as to how far a polar bear can see on the sea ice. Scientists from Russia report that polar bears have poor eyesight. 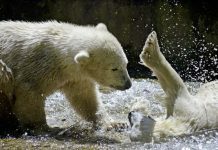 Certain biologists however believe that white bears have been underestimated in sight. They are able to see things, animals or even humans from long way off. It is just that we (scientists) couldn’t come up with the appropriate scientific explanations. The spherical-shaped polar bear’s eye allows it to visualize things on land but not underwater. In marine mammals the eye lens is usually spherical because it provides a shortest focal length for a given diameter. 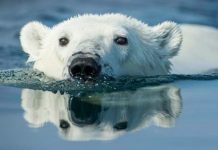 However in polar bears the lens doesn’t seem to provide any such acute vision underwater. The white bear’s eye possesses a circular pupil. Polar bears have got the ability to see animals under low-light conditions which helps the bear to hunt at dusk. The iris in the eye is brown and it doesn’t appear to change its color. Can Polar Bears See Color? Polar bears are dichromats meaning they are able to match any color they see with a mixture of only two colors. This particular trait is extremely rare in humans. Humans typically possess trichromatic color vision. Polar bears are known to see colors though not in a way humans do. Perhaps thanks to nature that white bear’s eyes are small which makes it less vulnerable to snow blindness. The greater is the eyes the greater is the risk of snow blindness. Polar bears can see long and short cones. The short-wave cones are thought to be rather susceptible to blue light whereas long cones to yellow light. There is a middle cone that is prone to the green light. Humans possess the middle cone which is what makes them trichromatic. It means that polar bears can’t see green light. However it’s logical to assume that polar bears don’t need to see green light on the icy habitat. Their eyes are equipped with rods which allow them to see things at night. This is a highly useful trait in the long nights of the Arctic. 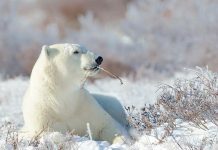 Although polar bear do not typically rely on their vision they can see reasonably well perhaps not as bad as one might anticipated. 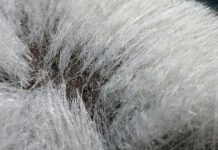 How far can a polar bear see? Photo by Eyes On You Safaris. Why Can’t Polar Bears Go Snow Blind? The visible portion of the eye is small which is good because there can be 24-hour sunlight with continuous snow blowing in the Arctic Ocean. If humans were to spend that much time on the sea ice they would probably go blind in just few hours. Snow blindness occurs when the ultraviolet light reflects from the snow to the eye surface causes the latter to burn. No wonder it is highly painful but polar bears are oblivious of it. Scientists have yet to figure out the scientific answer. Other animals such as Ground Squirrels can also avoid snow blindness but they have yellow pigment in their cornea which prevents the squirrels from ultraviolet reflection. The yellow pigment serves as sunglasses. 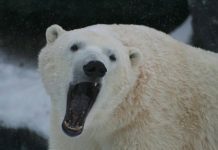 There is no such pigment in the polar bear’s cornea. Biologists maintain that white bear’s eye must have something that acts as a protector but they don’t know what it is. However there’s one thing they know (for sure) that polar bears do not suffer from snow blindness.